Cactus Shadows Jake Benci (1) drives to the hoop late in the game against the Tempe Buffaloes, Thursday, 12/7/17. The Falcons won 80-69. Photo by Gina Brown. On a night where it appeared to match up two evenly talented Division 4A teams, this one did not disappoint. In the end, the Falcon boys found a way to maintain control over a tough and talented, well coached Tempe Buffaloes squad, improving to 7-1 with an 80-69 victory last Thursday night. The Falcons did well to stay within 1 point in an 18-17 1st quarter, with Naseem Vigil of Tempe putting up 13 of his 23 total points, on a barrage of off balance 3 point shots hitting nothing but net. The game stayed close in the 2nd quarter, but the Falcons stayed the aggressor by attacking the rim, and getting to the free throw line. CSHS ended the half with a 5-0 run in the last minute of the half behind an “and 1” drive to the hoop by Junior forward Duncan Hearn, and 2 free throws by Senior guard Alex Hamouz with 1.6 seconds left to stretch the lead to 38-33 at halftime. In the 3rd quarter, the Falcons were able to build on the lead (60-49) with steady scoring from Junior guard Jake Benci, and a strong defensive effort on Vigil of Tempe, who clearly was working harder to get open looks, putting pressure on other Buffaloes to score. In the 4th, Tempe began to run virtually every possession through their talented post player, 6’7” Junior Jalen Grant, who gave the Falcons fits all night with 24 points, mostly in the paint. As the Buffaloes fought to get the score down to single digits, Falcons Head Coach Zach Washut made a key adjustment about a minute into the 4th quarter. Taking advantage of the versatility of his roster, Washut put the ball into the hands of his longer players Sam Goulet, and then later Hearn, forcing Grant to come out on the ball, creating a mismatch for the Falcons, and opening things up around the basket. This seemed to spark a run by The Falcons and push the lead to an insurmountable 79-62 score with only about a minute left on the clock. “Tempe had a terrific scorer that put up double digits in the 1st quarter. We had to make an adjustment and the guys worked hard to keep him under control the rest of the game. I thought we attacked the paint well and earned a hard fought victory,” said Washut. 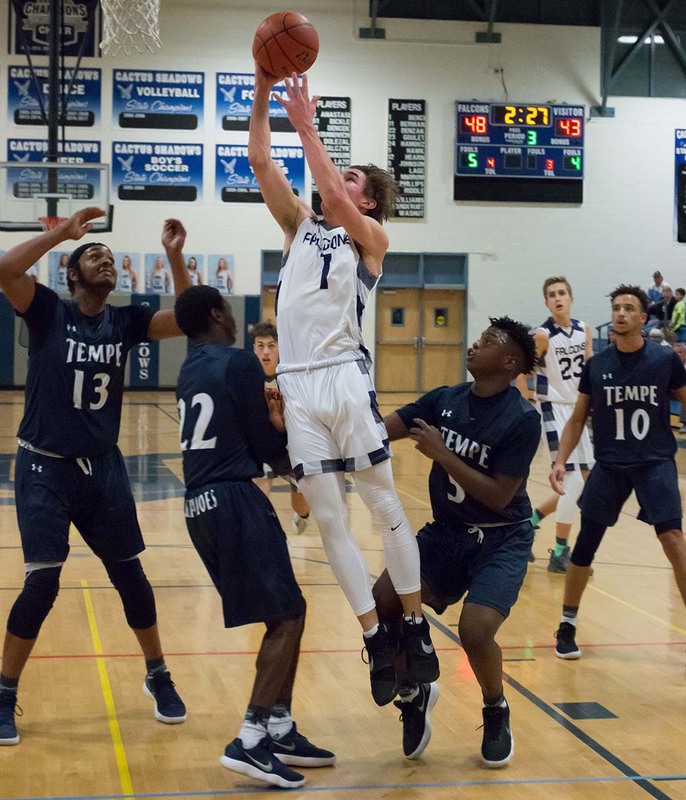 The leading contributors for Cactus Shadows were Jake Benci (21 points, 9 rebounds), Duncan Hearn (16 points), Sam Goulet (13 points, 7 rebounds) and Knox Riddle (10 points, 3 steals). 78% vs 42%…the disparity of free throw shooting gave CSHS a huge advantage for the game, making 28 of 36 FTs vs. Tempe hitting only 8 of 19 from the line. Jake Benci hustled for a rebound on his only missed FT on the night, then buried a fade away 10 footer from the right baseline, as he was shoved to the ground…And one!!! FALCON’S RECORD: Overall: 7–1, Section: 0–1. FALCON’S NOTES: This Thursday, 12/14/17, 7p. Falcons play at home, celebrating Teacher Appreciation Night…lets pack the house, and give our great faculty the support they deserve. Also – reminder all adults 55 and older can receive a free season pass to all Falcons athletics from the CCUSD offices, 33016 North 60th Street, Scottsdale.